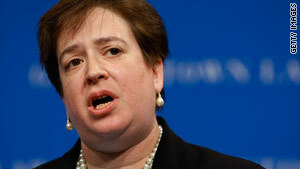 Solicitor General Elena Kagan is on President Obama's Supreme Court short list. Washington (CNN) -- "You are not my people." That was Elena Kagan's blunt but light-hearted declaration when she greeted conservative legal minds meeting at Harvard's prestigious law school in 2005. As dean, Kagan warmly welcomed the thousand or so members of the right-leaning Federalist Society but let them know she shared few of their views on the law and society. Those bipartisan skills, and her limited public comments on hot-button issues, have generally kept Republican criticism at bay and put the 50-year-old experienced lawyer and policy-maker near the top of the contenders for nomination to the Supreme Court. "Kagan has a lot of fans on the right as well as the left from her time as the dean of Harvard Law School," said Thomas Goldstein, a noted Washington attorney and founder of scotusblog.com. "She's someone who is an intellectual, who has earned a lot of respect. She's relatively young, a woman, and doesn't likely generate a significant political fight." But although she has never served as a judge, some on both the left and the right have found aspects of the New York native's record troubling, and if nominated, she could expect tough questioning on such issues as homosexual rights and national security. President Obama on Monday named Kagan as his nominee to replace retiring Justice John Paul Stevens. Obama did not have to look far when considering Kagan. As solicitor general, she is the administration's top lawyer before the Supreme Court and has argued several high-profile cases before the justices since taking the job in spring 2009. GOP Sen. Lindsey Graham told Kagan she presented a "positive impression." Democrats were similarly enthused. Whomever the president chooses, she or he would be a liberal replacing a liberal and unlikely to immediately move the court to the left. Nevertheless, many on the right worry what a Justice Kagan would bring to the court.